Nikon’s 1 series cameras adopts a smaller 1-inch type sensor which allows the firm to offer lenses that are substantially more compact than most rivals with mirrorless offerings. In fact with the exception of the new 32mm f/1.2, the lenses are so small they actually lack focus rings. Manual focus is still possible, however, it’s just that control is made via the camera body. The small sensor also accounts for the shorter than usual focal lengths on offer. The new $500 image stabilized 1 Nikkor 6.7-13mm f/3.5-5.6 VR and $187 18.5mm f/1.8 have the equivalent angle of view in full-frame 35mm terms to a very useful 18-35mm and 50mm, respectively. From our findings on 1 Nikkor lenses, the 18.5mm f/1.8 and 6.7-13mm are the best performing lenses of their type in the range, thus far. However, we’ve yet to assess the new large aperture Nikon 1 Nikkor 32mm f/1.2 which is promising, though perhaps unlikely to outdo the 18.5mm. Although the Nikon 1 system adopts a small 1-inch type sensor, we’ve compared the 6.7-13mm f/3.5-5.6 on a 10-Mpix Nikon 1 V1 to the comparable Sony E 10-18mm f/4 zoom lens, only this time it’s mounted on a high pixel count (24-Mpix) Sony NEX-7. 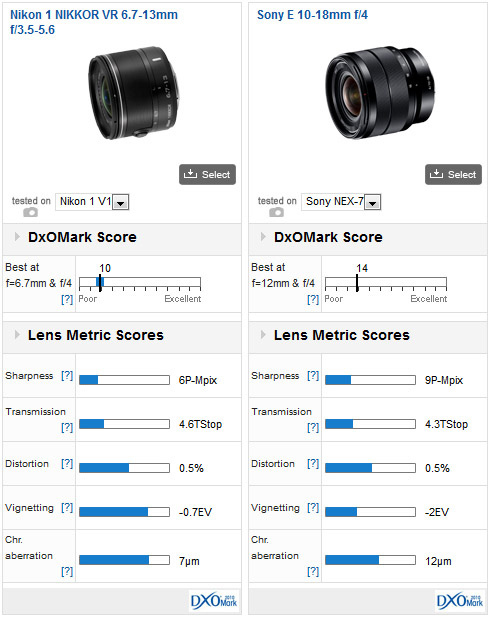 With a DxOMark score of 10 for the Nikon against the 14 of the Sony, it’s clear that the latter is the more capable of the two but the Sharpness scores are hampered by the lowly pixel count of the Nikon 1 V1 body. Be that as it may, the lens/sensor efficiency is better than that of the Sony combination, and it has good transmission and low levels of distortion and lateral chromatic aberration. 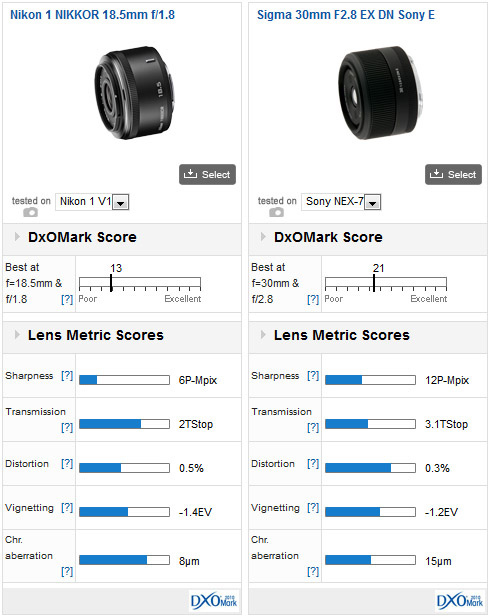 With a DxOMark score of 13 points, the 18.5mm doesn’t score so well against the Sigma 30mm f/2.8 EX DN, which scores a high 21 points. Like the previously tested 6.7-13mm f/3.5-5.6 model, part of this can be attributed to the lower-pixel count of the Nikon 1 V1 sensor but, in reality, the lens is no sharper than the firm’s zoom. On the plus side, the 18.5mm has low levels of chromatic aberration and good transmission, but it has quite strong distortion for a ‘standard’ or ‘normal’ lens and control of vignetting is really only average. Nikon can be praised for expanding the 1 Nikkor lens range so quickly and the 18.5mm f/1.8 is a good choice for stills and budding movie-makers. As it stands, it’s the highest performing lens in the range but at $187, it’s almost as expensive as the firm’s full-frame AF-S 50mm f/1.8G. 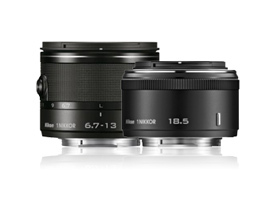 For those looking for additional versatility, the 1 Nikkor 6.7-13mm f/3.5-5.6 may be more appealing. It offers similar sharpness to the 1 Nikkor 18.5mm, and while lacking the constant aperture found on Sony equivalent, it does have stabilization built-in.